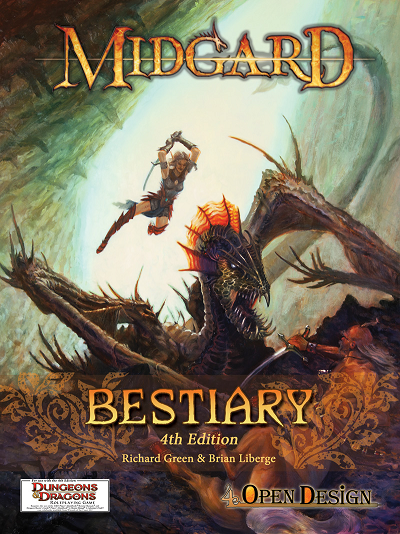 As of this writing, the Kickstarter for the 4th Edition Midgard Bestiary has met its $6,500 stretch goal and exceeded it. So if you haven’t already kicked in on the project, check it out. You can also see a sample of the Zmey over on Part 3 of the Designer Diaries for this book! One of my favorite things about 4th Edition is how easy it is for the GM to assemble groups of monsters of a single theme or type and create a fun encounter for the players. Having goblins, kobolds, or undead of different roles, or with varying powers, appearing together keeps things interesting. I hope that this is something that carries over into D&D Next. Monster groups were something we wanted to make sure we included in the Midgard Bestiary, and we found quite a few opportunities to do this. 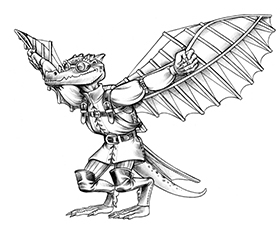 The Arbonesse elves, dwarves of the Ironcrags, clockworks, gearforged, Mharoti dragonkin, and kobold ghetto guard entries all feature several different monsters based around a single theme, making it easy for the GM to build a varied encounter. My favorite example of a monster group is the “Mages of Allain” entry. The Magocracy of Allain, located at the edge of the Wasted West, is a fascinating part of Midgard. Here the survivors of the Great Mage War continue to practice dangerous magic, and many of them were corrupted by the alien powers of the Realms Beyond. Josh Jarman had created a Bemmean wizard for the AGE Bestiary, a sinister hooded figure reminiscent of Ningauble and Sheelba from Fritz Leiber’s Lankhmar stories. I have never played AGE, so I was essentially building the 4E version from scratch as a level 13 elite controller, creating new powers to capture the spirit of the AGE spells black geas and wrack. The Bemmean wizard was “accompanied by 1d3 sand devils from the Western Wastes that act as guardians and thugs.” These sand devils didn’t have their own stats, so I built them as level 10 lurkers that can unleash a blinding sandcloud, and I gave them a backstory. They are now the harborgoi, created by the warped magical energies of the Great Mage War. To round out the group, I looked at the other cities of the Magocracy. Maillon is a swamp city where many dangerous alchemical experiments are conducted, often creating “interesting” side effects. A mutated spellcaster with writhing tentacles and a penchant for blowing stuff up sounded like a good idea, so I added the Maillon alchemist as a level 11 artillery. Tintager is on the border with Arbonesse and attracts outcast sellswords and tiefling warmages willing to fight against the “elvish agressors.” The Warmage of Tintager is a level 11 skirmisher, capable of wielding a cold iron longsword in melee, as well as flinging blackfire bolts at anyone who crosses his path. With three different mages of Allain, each fulfilling a distinct role, plus the invisible sand devil, we’ve made it easy for the DM to build a challenging and interesting encounter. I hope you have as much fun running these guys as I did when playtesting them in my campaign!